Bologna, also known as baloney, is a widely popular sausage made from a combination of seasoned meats, usually beef and pork. 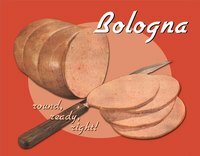 Bologna is often used in sandwiches and is widely available at delicatessens and grocery stores. Although it can be easily purchased, some prefer to make their own bologna. Combine all ingredients thoroughly, with the exception of the liquid smoke and oil, in a very large bowl (or on a flat, clean surface). Place the mixture in an airtight container or cover well with plastic wrap and refrigerate overnight or for 5 to 6 hours. Combine the liquid smoke and the oil. Add the smoke-oil mixture into the meat mixture and mix thoroughly. Pack the mixture tightly into oven-safe cylindrical cans. Clean, empty coffee cans are best. Leave approximately ½ inch of space at the top. You will need approximately 8 cans if you use the small ones or 5 if you use the large ones. Bake the cans in the oven for 3 ½ to 4 hours uncovered at 200 degrees Fahrenheit. Make sure the cans are all in an upright position. Let cool for an hour. Drain the excess liquid and wrap tightly in freezer paper. Freeze or refrigerate depending on when you are planning to serve it. How Do I Heat Up Gyro Meat?